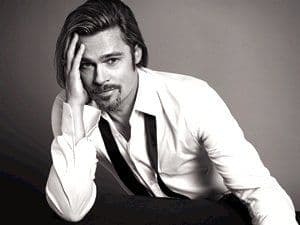 French fashion house Chanel has unveiled a series of teaser videos for its global campaign starring Brad Pitt, ahead of its much-anticipated launch next week. The American actor will front a campaign for its iconic Chanel No.5 women's perfume, marking the first time in its 91-year history a male has endorsed the scent. The luxury brand, which first announced Pitt as its new face in May this year, has now released a number of YouTube teaser videos to create hype in the lead up to its 15 October global launch. The videos show a still of Pitt's back and feature audio of the actor asking mysterious questions like 'Do you feel lucky? ', 'Where are you going?' and 'What's the mystery?'. They close with the Twitter hashtag #ChanelN5, and are just short of 10 seconds each. Pitt is reported to have received over $7 million, with many sources putting the campaign's overall ad spend at $10 million. The global push will span across several platforms including television and print and has been directed by Atonement's Joe Wright. The father of six and husband to actress Angelina Jolie will not front any other Chanel campaigns following this one. Chanel president of fragrance and beauty Andrea d’Avack spoke to Women's Wear Daily (WWD) about the new push. "We believe this dynamic, modern campaign will make people think in a completely different way about No.5. "To keep a legend fresh, you always have to change its point of view. It is the first time we've had a man speaking about a women's fragrance. "We think very much that the perfume is a seduction between a man, a woman and the perfume. No.5 is our leading fragrance, and we are willing to make the investment to keep it on that level." Marilyn Monroe, Nicole Kidman and Audrey Tautou are just some of the celebrities to have promoted the perfume in the past. What do you think of the campaign? Let us know your thoughts in the comments below. View the teaser videos here.